With my sights set on returning to full Ironman in 2018, I wanted every race in the lead-up to Austria to be a stepping stone towards that goal. As I haven’t raced full distance (or indeed a marathon) since 2014, it was a bit of an unknown once again. I know I am a lot faster than I was four years ago, but will I have the endurance to back it up? To ‘validate’ my entry in the Chiltern 50 – a 50-mile ultra marathon I have entered in September! While my coach Mark sort of said: “well I wouldn’t choose to put a marathon in there but if you want to do one we can work with that”, I went ahead anyway and entered Manchester Marathon. By mid-March I was a bit nervous. I had run a half marathon PB so knew that the threshold development was working, but I hadn’t completed any runs longer than about 1.5 hours! Questioning Mark (as I do! ), he said we wouldn’t be looking to peak for Manchester – we are looking to peak for Austria, so don’t want to do too much at this time of year. Ok, made sense, but I resigned myself to the fact that I wouldn’t perhaps get the performance I was hoping for as we hadn’t done masses in the way of marathon prep work. In mid-March I went to Spain on a training camp and we used the opportunity to get some serious running in. Again, I was a bit concerned that it was all a bit too late as we were only three weeks away from the race, and there was some serious volume in there! But I have to say, it instilled a massive amount of confidence in me. In four out of eight days I ran over 30km, with double session run days and a fair bit of threshold work on top of longer steadier stuff. Finishing that camp with 160km of running in my legs, and what’s more, feeling good on it, was a real boost. I felt ready. Readier than I could possibly feel. A two week recovery/taper of ticking over and I started to feel fresh and ready to race. We kept some intensity in the programme for the week leading up to the marathon, with a few short sharp turbos and interval runs to avoid any sluggishness. A day of carb-loading and driving up the day before the race, a very sub-par night’s sleep and a nice leisurely 9am start time (triathlon world, take note! ), and I was on the start line. I felt so positive about this race – far more positive than I usually am, and I was really excited about it. Less nervous – more excited, I wish I always felt this relaxed before a race! The gun went off and I was in a good position not too far back. 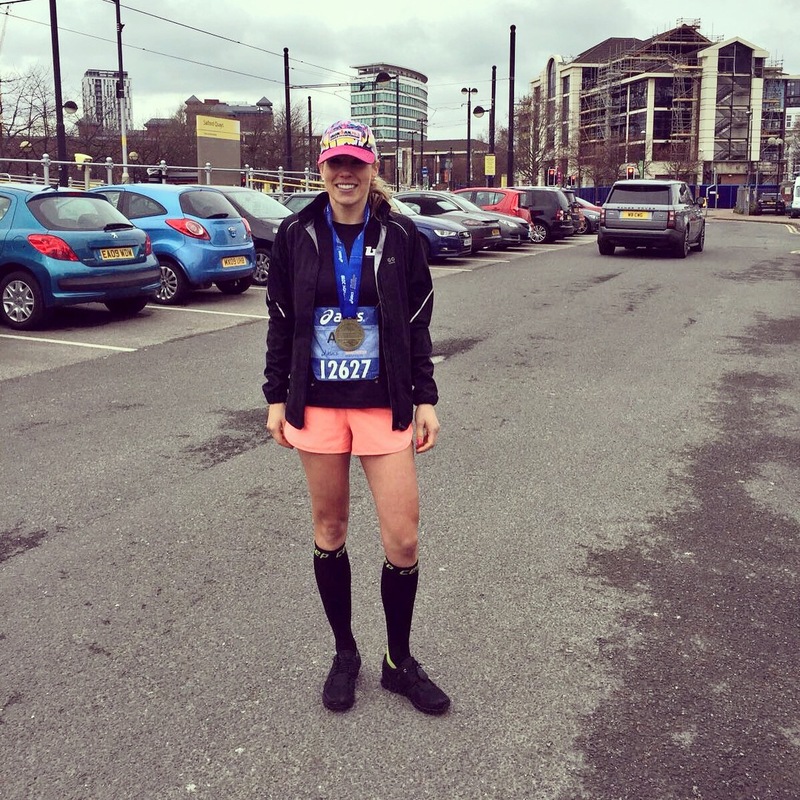 I settled quickly into a comfortable pace – that’s one benefit of Manchester over London marathon, the course is a lot less congested which makes holding any desired pace beyond a fun-run plod much easier! I had to hold back a bit to begin with, conscious of how far I had to go. I know quickly within myself whether I’m going to have a good day, and I knew it as soon as I started running. At 5k and again at 10k as I did a quick routine “how am I feeling” assessment, I confirmed that I felt “perfect”. It was great positive language to use – I decided that if I could feel absolutely optimal, this is how it would feel. I couldn’t feel any better, so let’s make the most of that and get it! You get the internal diatribe that goes on. It was far less of the usual “Christ how the hell am I going to get round this” and “I feel like I might actually be dying” and far more of the “I feel too good to be true”! Winning. I reached the half marathon point in 1:38 which I was pretty happy with considering how comfortable I felt. I was cruising – and that was only just over three minutes off my half marathon PB! The only discomfort I had was that I really needed to pee, and had to debate whether or not to try and hold it for the rest of the run or lose some time and stop. At half way I decided I couldn’t run another 21km with an uncomfortably full bladder so pit stop it was. I dashed into a portaloo – something I have NEVER done during a race before! Much better. Not sure I even lost that much time, maybe 30 seconds or so. Onward. Gel strategy was going well. One Torque gel every 25-30 minutes was going perfectly. No stomach cramps or any other cramps for that matter, although one of the gels had guarine in which made me feel very slightly bloated for a few miles, which then thankfully disappeared. At mile 16 I had the only ‘wobble’ of the day. I was starting to feel the fatigue and mental challenge really embed itself, and all I could think was that I had another 10 flippin miles to go. God a marathon is a long way. Luckily, I was getting a lot of support from the crowds. I think because there were hardly any women around me, I was getting a bit more noticed than others. The support was fantastic, a real boost, especially in the last third of the run. The miles just seemed to disappear and before I knew it I was at 20, then 25! It went so quickly. I kept the pace strong – I think I had only lost about 3-4 seconds per km throughout the entire race. I’d had a target time in mind of 3:20 but was secretly aiming to go sub-3:20. I had clocked that by mile 20, I had created a good ‘buffer’ so that even if my pace slipped to 5/km (which wasn’t even close to happening anyway), then I would still get 3:20. At mile 25 I pushed on, I still felt like I had a fair bit in my legs – I was tired, my legs were aching, but cardiovascularly I felt absolutely fine. People were really waning from about mile 18 onwards, but I managed to stay strong. I was smiling at mile 25, I was feeling so good! I went through the finish in 3:17:30, absolutely over the moon with my time. I later found out I was 55th female out of 2,000 and 15th in the senior women’s category. I’ll bloody take that, for someone who isn’t even a runner! I felt comfortable throughout the whole run and although I was hurting at the end, I wasn’t wiped out. This makes me think I definitely have a bit more in me, and minus a pee stop as well, I could well be looking at sub-3:15. I absolutely loved the whole experience, one of the most enjoyable races I’ve had in a long time. Thank you Manchester.